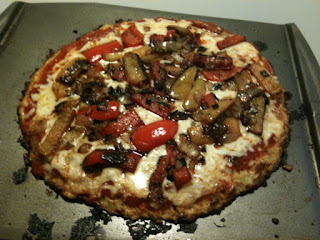 I just whipped up some gluten free pizza, and it was awesome! The crust is super simple to make and is cauliflower based. In my picture I burned my peppers a little while sautéing, but it was still super yummy! Remove crust from oven. Spread sauce and cheese on top. Top with whatever toppings you want! Bake for another 10 minutes (or until cheese is melted and it looks delicious). My crust didn't ever get super crispy, so it had to be eaten with a fork. I think if you dry the cauliflower and make sure your crust is browned on top before adding final toppings you should be in a good place.